TheSamba.com :: Beetle - Late Model/Super - 1968-up - View topic - Fuel filler line replacement help/do I have the right gas tank? Fuel filler line replacement help/do I have the right gas tank? Posted: Sun Jul 29, 2018 2:43 pm Post subject: Fuel filler line replacement help/do I have the right gas tank? Hey guys. I have a 74 standard (production date dec 73, but everything seems to be 74 model year) that has been reeking of gas recently so I decided to replace my fuel filler line and sending using seal (kit from CSP). The seal went without a hitch, but now that I have the filler hose off, I am have quite a bit of trouble getting the new one on. It seems to me that the neck of the gas tank is not only too large but also has been bent a bit so that it is now an oval shape. As far as I can tell, that shouldnt be the case. On top of that I dont seem to have the vent on the front diver side of the tank as I should and instead have a secondary bung. This leads me to believe I may have a slightly incorrect tank, but the filler hose I am replacing was on it just fine it seemed like (and it turns out its still totaly fine with clean sealed internals). So, do you guys have any advice for getting the hose on the tank? What about keeping the thin rubber seals in place on the intermediary neck when placing the tubes on that one? 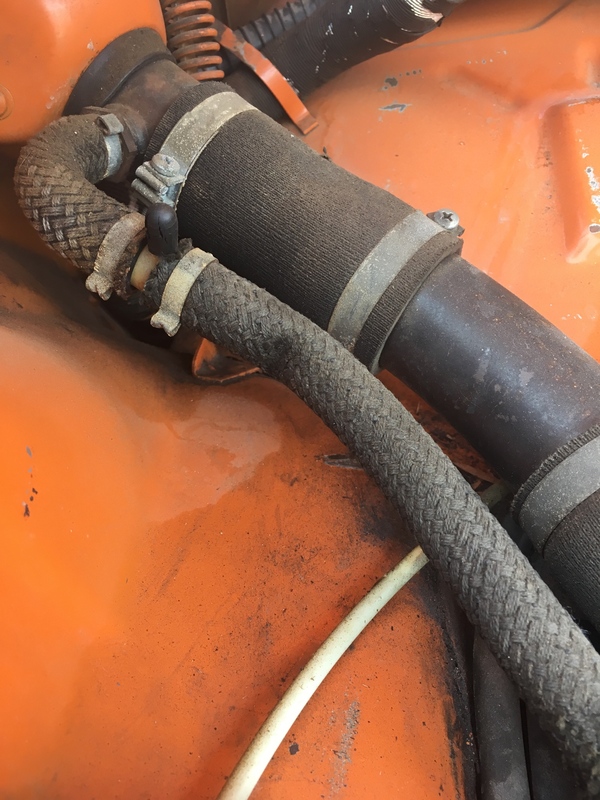 Alright guys, so I got the still good hoses back on the mount, and I think I have discovered the two likely causes of the absolutely nauseating fuel smell. The first is, apparently someone removed the breather hose and just capped the t fitting. The second is that the gasket on my fuel cap is entierly shot. I hope replacing those two works, but I may replace the thicker breathing tube as well to be safe. Posted: Sun Jul 29, 2018 3:00 pm Post subject: Re: Fuel filler line replacement help/do I have the right gas tank? 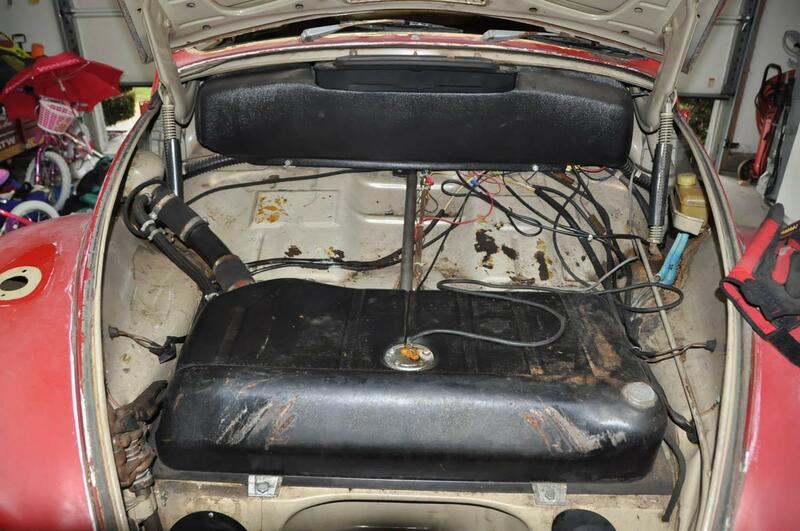 Yeah - need pics....and usually the smaller "overflow" lines that run aling the main fuel inlet are the culprit. Replace those as well. I think its usually 5/8" ID. 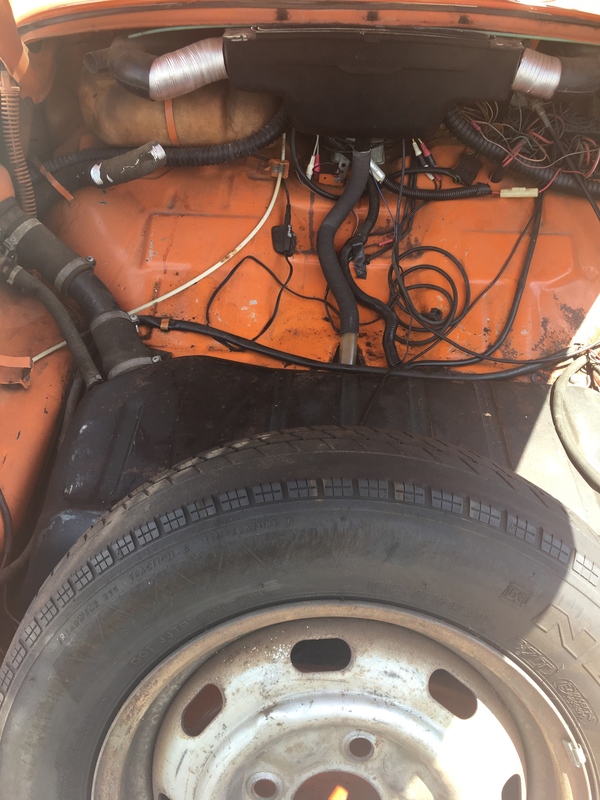 Posted: Sun Jul 29, 2018 3:38 pm Post subject: Re: Fuel filler line replacement help/do I have the right gas tank? 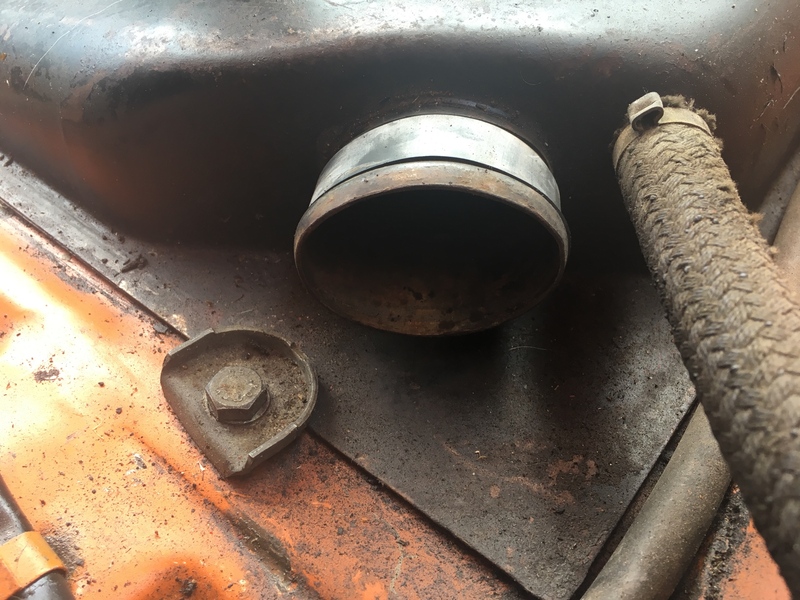 If your tank has an oval neck then welcome to the world of the 1968 tank, make that partial year 68 tank, make that non obtainable fuel filler hose 68 tank. 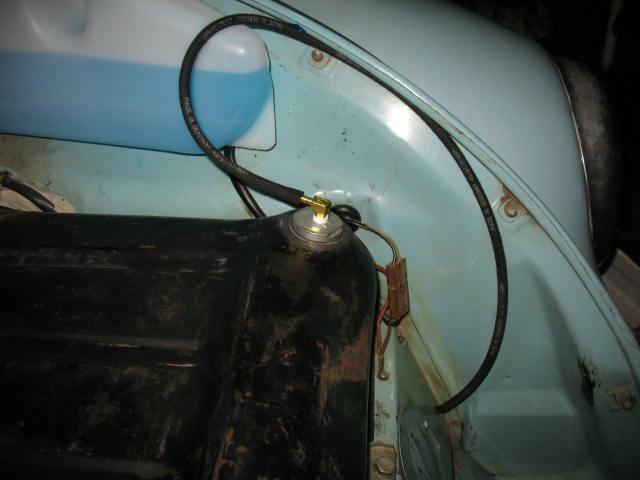 But not all is lost, if you do have the early 68 tank there is a 2-1/4 to 2" hose available, the 2-1/4 fits the oval. Here is a picture of a 68 tank in my 71. Posted: Sun Jul 29, 2018 4:28 pm Post subject: Re: Fuel filler line replacement help/do I have the right gas tank? pics are posted. And yah, I know the tank was replaced about 10 years ago now due to rot and I suspect the main couplers were replaced then, but idk for sure. I would expect the secondary breather that runs parallel was replaced at the same time, but the clamps currently on it look factory so maybe not. I luckily got the original hoses back on and sealed up for now, but I think i would still like to replace them to make sure. Question though. I plan to remove my front tank to work on the front end in the next week or two anyways, should I just blow the money and get a non 1/2 year tank that I can plumb propperly? The tank looks alright, but I honestly dont realy know the state of it for sure. EDIT: Also, does a 68 1/2 tank use a vented cap? Mine is not vented, but I need to replace it anyways since the seal is shot, so either way, what should I look for? Posted: Sun Jul 29, 2018 6:12 pm Post subject: Re: Fuel filler line replacement help/do I have the right gas tank? So, do you guys have any advice for getting the hose on the tank? What about keeping the thin rubber seals in place on the intermediary neck when placing the tubes on that one? Lube the rubber tubes with alcohol, alcohol gel hand sanitizer, or similar to get them on (I recently added new hoses to my 1970). Maybe get those on before the tank is bolted in, tight fit. You don't need the thin rubber seals (and don't think that they are available any more anyway). I have a 74 standard that has been reeking of gas recently..... The second is that the gasket on my fuel cap is entierly shot. I've had the similar gas cap seal go bad on my 1971 Super (of course the same week my '88 Mazda truck fuel pump leaked, had 2 gas smells in my garage, not just the one I thought !!!). Also, you have a bad vacuum cap there in your photo, cap all cracked; fix that with vacuum tube and a wood golf tee or a real rubber cap. Posted: Mon Jul 30, 2018 5:33 am Post subject: Re: Fuel filler line replacement help/do I have the right gas tank? Use the stock gas cap, run a vent line from the tee (cap on yours now) to exit on left side beside the spare tire. On mine I just tapped the bung put in a vent line. Posted: Mon Jul 30, 2018 4:25 pm Post subject: Re: Fuel filler line replacement help/do I have the right gas tank? Huh. My CPS kit came with them. Though I put the original filler hose back, I did get those sat underneath it before I clamped it down. haha. Yah. What I understand is that they go bad fairly fast compared to the other components. As for the vacuum cap, as I understand it, that cap shouldn't even be there in the first place and have a hose run off of it and out of the car. I managed to pick up a new cap and a bunch of hose today, so my plan is to replace that cap with the hose tonight. I got some hose and plan on running that tonight. 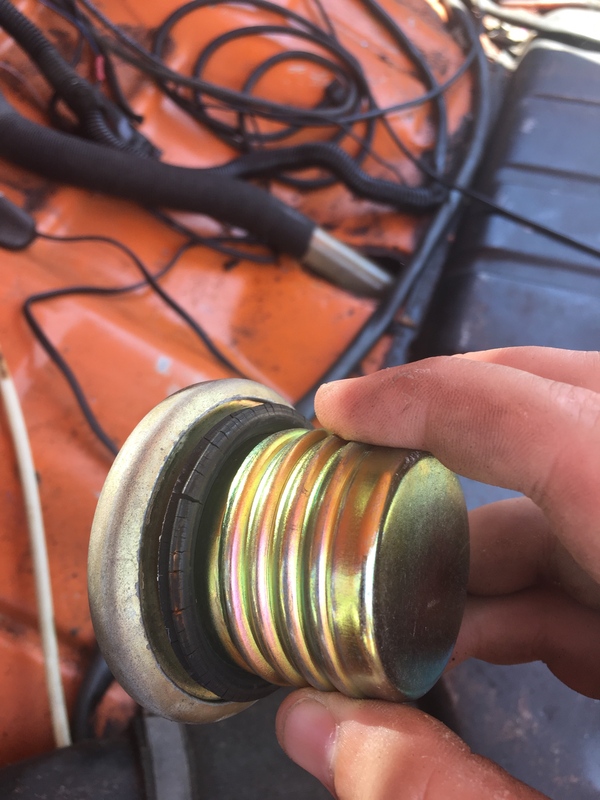 I actually ran into the guy that use to work on the car for the previous owner at a VW shop in my area today and he said that with the t-line installed there shouldn't be a need to tap the bung and that it was mostly left due to the old tooling, so we will see how it works. Unfortunately I still dont have a good line on the 17mm tubing. I can get some after an hour plus drive, but no where close to me seems to have it. Posted: Mon Jul 30, 2018 4:51 pm Post subject: Re: Fuel filler line replacement help/do I have the right gas tank? What 17mm tube? 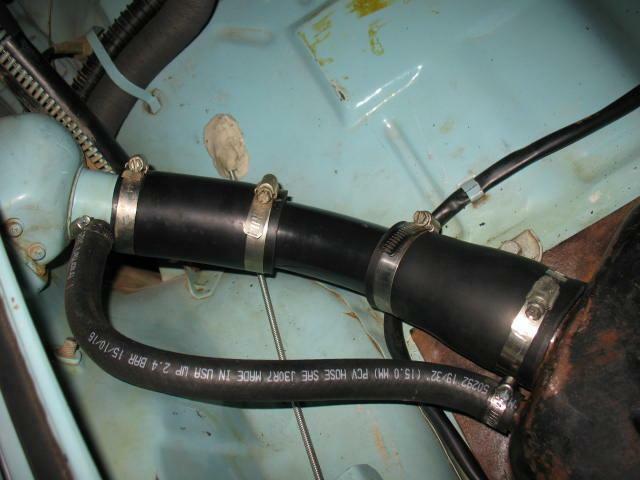 The overflow line is like 15mm but the US PCV hose in 19/32 is a perfect fit and available at every auto parts store. If you run the "T" in the overfill hose then you do not need to tap the bung, I didn't want a 4mm vapor line snaking across the trunk. Posted: Mon Jul 30, 2018 5:00 pm Post subject: Re: Fuel filler line replacement help/do I have the right gas tank? Posted: Mon Jul 30, 2018 5:09 pm Post subject: Re: Fuel filler line replacement help/do I have the right gas tank? Check out the second post (mine) on this thread. I listed out the various threads I used to re-construct my fuel vapor/venting system. Those threads I list also have the hose sizes.